We also gave you a list of some of the OTHER songs that Roger Cook had a hand in writing and producing ... a VERY impressive list indeed. Click here: Who is Roger Cook - Songwriter ? we've constructed a Roger Cook Time Line, spotlighting some of the highlights of his illustrious career. 1958 - Thanks to a teenage crush, Roger composes his first song, "Judy My Darling". Later that year, he forms his first singing group, The Sapphires, who go on to win a National Talent Competition. This recognition allows them to tour U.K. Cabarets and U.S. Air Bases. Before the year is over, The Sapphires record their first (and only) LP. The Early '60's find Roger Cook working successfully as a pantomime artist! 1965 - Cook is asked to join Roger Greenaway's group The Kestrels, which also includes singer Tony Burrows. Backstage in a dressing room one night, Cook and Greenaway write their very first song together. That song ... "You've Got Your Troubles" will go on to become a HUGE International Top Ten Hit for The Fortunes before the year is over. Later that year, The Kestrels disband after Burrows decides to pursue a solo career. The two Rogers (Cook and Greenaway) continue to earn a living by singing background on a number of recording sessions for other artists like Tom Jones and Billy Fury. Meanwhile, songs written by the songwriting team of Cook and Greenaway continue to be recorded by a variety of British artists like Petula Clark. 1966 - In January, David and Jonathan record "Michelle" ... days later, they perform the song on the popular British music television series "Ready, Steady, Go". Soon they are on their way to The United States for a series of radio and TV appearances, accompanied by George Martin. The following month, they release their first album, (also produced by Martin), which includes The Beatles' songs "Michelle" and "Yesterday". Later that year, Gary Lewis and the Playboys score a Top Ten Hit with the duo's "Green Grass". Meanwhile, David and Jonathan are on tour as one of the opening acts for Herman's Hermits. By year's end, they have written and recorded radio spots for Coca Cola along with artists like The Fortunes, The Troggs and The Tremeloes. 1967 - The duo's second LP release (as David and Jonathan) is their Greatest Hits album, released in Germany only! Their songs continue to be interpreted by a wide variety of artists, including Nancy Wilson, Gene Pitney, Cliff Richard and Brenda Lee. Here in The States, Whistling Jack Smith scores a Top 20 with "I Was Kaiser Bill's Batman", a tune we featured yesterday in Forgotten Hits. (BTW ... DIDJAKNOW? : The original title of "I Was Kaiser Bill's Batman" was "Too Much Bird Seed".) David and Jonathan mine the Lennon - McCartney well one more time when they release their version of "She's Leaving Home" that summer. Later that year, they recorded the original version of "Softly Whispering I Love You", which would go on to become a Top 30 U.S. Hit five years later for The English Congregation. 1968 - David and Jonathan announce the end of their recording career, stating that they will continue to work together writing songs for other artists. Meanwhile, Cook takes a stab at a solo career, releasing his version of Elton John's "Skyline Pigeon" as Roger James Cooke. 1969 - Madeline Bell is asked to add her vocals to a new recording by Blue Mink. Roger Greenaway is also approached, but declines the offer, suggesting they contact Roger Cook instead. Soon, Cook and Bell are singing together as Blue Mink on the first of seven British chart hits. career as a solo artist, Tony Burrows is suddenly ALL over the radio, ghost-singing lead vocals as The Pipkins (Gimme Dat Ding), Edison Lighthouse (Love Grows), The Brotherhood Of Man (United We Stand), White Plains (My Baby Loves Lovin') and later First Class (Beach Baby)!!! Meanwhile, Cook continues to score U.K. hits with Blue Mink. In their "spare time", Cook, Burrows and Madeline Bell also add their voices to Elton John's latest LP. In March, 1970, British television history is made when Blue Mink, Brotherhood Of Man, Edison Lighthouse and The Pipkins ALL appear together on the BBC television series "Top Of The Pops". Incredibly, ALL of those groups now feature members of the now defunct, long-disbanded Kestrels!!! Roger Cook, Roger Greenaway and (especially) Tony Burrows leap from stage to stage between numbers to fill all of the necessary spots required in this incredible TV line-up. They later receive a warning from The BBC "not to try and fool them again with their many disguises"!!!!! In May, Cook and Greenaway are awarded The Ivor Novello Award for "Song Of The Year" for Blue Mink's "Melting Pot". January, 1972 - Three of the Top Four songs on The British Record Charts were composed by the songwriting duo of Roger Cook and Roger Greenaway. The New Seekers hold down the #1 spot with "I'd Like To Teach The World To Sing", "Softly Whispering I Love You" by The ("English") Congregation (featuring former Blue Mink member Alan Parker) is at #2 and Cilla Black has the #4 record on the charts with "Something Tells Me Something's Gonna Happen Tonight", the theme song from her hit British television series. A month later, The New Seekers are invited to perform "I'd Like To Teach The World To Sing" at The White House by President Richard Nixon. That Spring, Cook and Greenaway are awarded The Ivor Novello "Songwriters Of The Year" award for the second consecutive year. Thanks to the success of their Coca Cola jingles, Cook and Greenaway are besieged with offers to pen OTHER advertising tunes for the likes of Mars, Milky Way, Cadburys Chocolate, Esso Petrol, Maxwell House, Levis and literally DOZENS of others. They also continue to write jingles for Coca Cola, which will be recorded by a number of "name" artists over the years. 1974 - Carol Douglas scores a Top Ten Hit with her version of the Cook - Greenaway penned tune "Doctor's Orders". Throughout the remainder of the '70's, Roger Cook's songs are recorded by Ronnie Spector, Madeline Bell, The New Seekers, Dusty Springfield and The Andrea True Connection. In 1976, Roger records an album of original songs in Nashville, Tennessee! Two years later, this unlikely pairing of Brit Roger Cook and Nashville's Country Music Scene will yield both a #1 Single AND the "Song Of The Year" honor when Crystal Gayle records Roger's "Talking In Your Sleep". In 1980, Cook will hit #1 again on the country charts when Don Williams records his tune "I Believe In You". Country crooners Johnny Cash and Juice Newton would also go on to record Cook tunes in the '80's. 1991 - David and Jonathan reunite on stage to perform "You've Got Your Troubles" for a "Cancer and Leukemia In Childhood" Charity Benefit Concert. 1995 - Roger Cook and Roger Greenaway are presented with a Lifetime Achievement Award by The British Association of Songwriters, Composers and Authors. Ironically, just a few weeks later, Nashville, Tennessee's Mayor declares "Roger Cook Day"! Before the year is over, Roger has moved back to Nashville. 1997 - Roger Cook is inducted into The Country Music Hall Of Fame ... the FIRST British writer EVER to be so honored. Later that year, George Strait records his tune "One Night At A Time" which goes on to top Billboard's Country Music Chart for five weeks and win The Song Of The Year Award. Funny that you should write about Roger Cook today. He just left my home in Naples FL, this morning after a three day visit that included finishing a recording of one of our new songs (to be used on my next CD) and writing another Rocker with Jack "Stack-O- Tracks" Grochmal who came to visit along with Roger. The three of us, old best of friends, once did a performance at "The Bluebird Cafe" in Nashville, calling ourselves "The Fabulous Flying Chunks!" Need I say more? We've had too much fun! Roger is a true inspiration. When my friends in New York City asked me, 23 years ago, what I was doing in Nashville I would always reply: "I'm studying songwriting with Roger Cook". Aside from being one of my dearest friends and one of the greatest songwriters ever, he's a free spirit who loves the beauty of the planet and celebrates the positive every day! His talent is undeniable and the songs he's created are truly unique and life affirming. As this is starting to sound a bit too much like a eulogy and I don't want to become my generation's George Jessel, I'll just say that to know him is to be blessed, to write with him sensational, to drink with him ... Divine! But the Roger Cook story is MUCH bigger than that!!! Many of these tracks have gone on to become radio classics ... but today we're giving you two of Roger's Forgotten Hits. And secondly, how about "I Was Kaiser Bill's Batman", a GREAT instrumental tune by Whistling Jack Smith from 1967 that went to #14 on the Cash Box Pop Singles Chart. I hope some of the jocks on the list will see fit to feature these great, over-looked gems as part of their special "Forgotten Hits" programming ... odds are your listeners haven't heard them in YEARS!!! Bell became a pretty successful jingles singer after that ... and did a fair amount of session work, too, working as a background singer for Kiki Dee, Cliff Richard, Tom Jones, Joe Cocker and Elton John, to name just a few. She returned to The U.S. Charts one last time in 1979, singing lead on a song called "Female Of The Species" for a Liverpool rock group called Space. DIDJAKNOW?-1: The first artist to record "I'm Gonna Make You Love Me" was Dee Dee Warwick, Dionne's little sister. Her 1966 version peaked at #88 and has been long forgotten, but THIS was the version that first inspired Madeline Bell to take a crack at the song. DIDJAKNOW?-2: As a favor to her former back-up singer, Dusty Springfield sang the backing vocal on Madeline's biggest hit, I'm Gonna Make You Love Me. Click here: Madeline Bell Homepage - the official web site for U.S. singer, resident in Europe. TRIPLE TREAT: Madeline Bell's version of "I'm Gonna Make You Love Me" is our featured Forgotten Hit today ... but we thought that we'd ALSO share with you the Dee Dee Warwick original version ... along with the #1 Hit by Diana Ross and the Supremes and The Temptations. Enjoy! Thank you for the message. It’s good to know there are still many, many people interested in some of the best music, and the best times in the music business. My version of “I’M GONNA MAKE YOU LOVE” was originally recorded by Dee Dee Warwick, who recently passed away. In my opinion the best singer of her time. I’d recorded an album in London (Mostly cover versions). Some beautiful person in the US offices of Philips / Mercury loved IGMYLM, printed 10k copies and sent them to DJ’s across America. Thankfully, the interest snowballed. I have recorded the song again on a CD “ANOTHER TOUCH”. If you click the link below you’ll more info. This CD is of new arrangements of 60’s and 70’s favourites. We just received word from John Rook, President of The Hit Parade Hall Of Fame, that they've announced The 2008 Inductees. The vote of fans worldwide have aided the nominating committee in inducting 33 more recording stars into the Hit Parade Hall of Fame. The 2008 inductees are the Bee Gees, Chuck Berry, Bread, Freddy Cannon, the Carpenters, Chicago, Lou Christie, John Denver, Dion, Doris Day, the Eagles, the Everly Brothers, Roy Hamilton, Tommy James & the Shondells, Elton John, Tom Jones, the Kingston Trio, Jerry Lee Lewis, Frankie Laine, Dean Martin, Guy Mitchell, the Monkees, Olivia Newton-John, Johnnie Ray, Johnny Rivers, Kenny Rogers, Linda Ronstadt, Sonny & Cher, Kay Starr, BJ Thomas, Johnny Tillotson, Jackie Wilson and Stevie Wonder. Qualifications for nomination require an artist to have had at least two top ten hits of any genre during a thirty year period beginning in 1950. It is the vote of fans, coupled with other factors such as career longevity, record sales and concert success that are then voted on by the nominating committee at the end of each year with inductees and nominees for the new year announced shortly thereafter. An artist has three years to gain induction before their candidacy is discontinued as a current nominee. Voting for new nominees begin when they are announced. 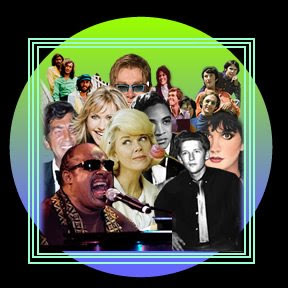 Previous inductees include Paul Anka, the Beatles, Tony Bennett, Pat Boone, the Beach Boys, Teresa Brewer, Johnny Cash, Ray Charles, Jimmy Clanton, Chubby Checker, Nat “King” Cole, Perry Como, Bing Crosby, Bobby Darin, Neil Diamond, Fats Domino, the Four Seasons, Aretha Franklin, Connie Francis, Brenda Lee, Johnny Mathis, Ricky Nelson, Roy Orbison, Patti Page, Elvis Presley, Neil Sedaka, Frank Sinatra and Diana Ross & the Supremes. While voting for recording stars already nominated, fans are encouraged to suggest future nominees and visit those already inducted at the website of the Hit Parade Hall of Fame. Our congratulations go out to all of this year's inductees. A list of 2009 nominees will follow shortly. One of my favorite songs from the early '70's is another one of those that just never seems to get played on the radio anymore. Sounding like nothing else out at the time, Crazy Mama really stood out on the radio play list ... and I've loved it ever since. It's one of those laid-back slow jams that just has a GREAT feel to it ... and it SHOULD be part of oldies radio programming today ... definitely one of those "Wow" songs that'll turn your audience on its ear. J.J. Cale's biggest fan just may be Eric Clapton, who immortalized TWO of Cale's best-known compositions, After Midnight (Clapton's first solo chart hit, #13, 1970) and Cocaine, an FM Classic Rock staple ever since it first appeared on Eric's 1977 Slowhand album. In fact, Eric Clapton thinks SO much of J.J. Cale that he endorsed his induction into The Rock And Roll Hall Of Fame in his recently published autobiography. (Unfortunately, Cale has never even been so much as nominated for this honor!) In fact, Eric pretty much echoed OUR sentiments regarding the multiple induction of Rock Hall of Fame members when he stated that J.J. Cale deserved a spot, pointing out that he, himself, had already been inducted three times while other great artists are continually ignored. The two first met while working with Delaney and Bonnie back in 1970. (Sadly, we lost Delaney Bramlett just a couple of weeks ago.) Cale had been in a High School band with Leon Russell, another frequent Delaney and Bonnie contributor, and years later Russell would sign J.J. to his Shelter Records record label ... which is where he enjoyed his Top 40 success! Clapton fell in love with J.J.'s music and eventually invited him to produce one of his own LPs. Over the years, Cale has done session work for Phil Spector, Bob Seger, Neil Young and Art Garfunkel ... and, in 1972, he released his OWN version of After Midnight as a single ... it peaked at #42 but again became a bigger hit here in Chicago, topping out at #26. (A decade later, Clapton would go on to re-record After Midnight for a beer commercial ... and then released it as a single again in its brand-new, slowed-down arrangement.) A third 1972 J.J. Cale single, Lies, just missed The National Top 40, also peaking at #42. Give a listen to Crazy Mama today ... and then give your favorite oldies deejay a call and ask them to play it on the air ... it's a song that DESERVES to be heard!